Hello! 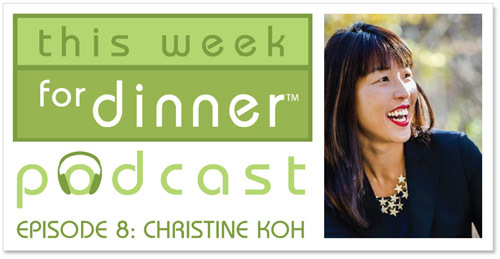 Today’s episode of the This Week for Dinner podcast is CHOCK FULL of awesome recipes and kitchen tips from my dear friend Christine Koh, the mastermind behind Boston Mamas, co-author of the book Minimalist Parenting and co-host of the podcast Edit Your Life. Christine was a blogging colleague who transformed into a dear friend after we spent 24 hours together in an SUV for a relay race. (For the record, Christine was running and I was driving.) Christine is super smart, super funny, and she knows good food. You’re gonna love her. Thanks so much for having me on the podcast Jane!